Hello! 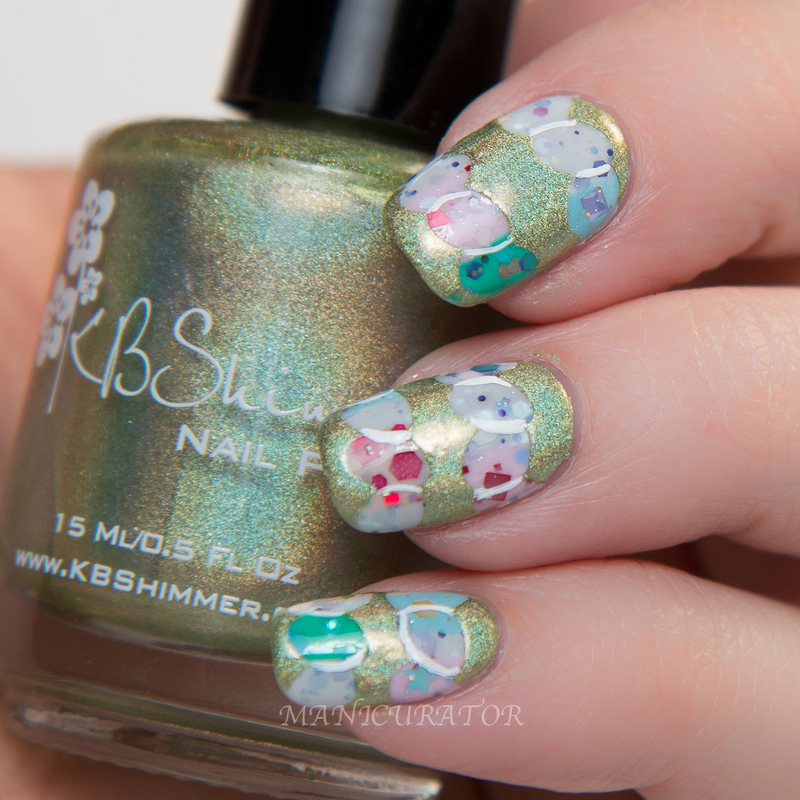 I'm so over the moon about this Spring collection from KBShimmer. You've seen the press release with all the shades and vinyls, I showed off all the holos and the flower vinyls and today the glitters. You can also see the swirls vinyl and thick/thin lines vinyls in this post. I actually was disappointed with how this one turned out..in that it looked different in my mind then how it turned out. I almost didn't post it, but then I remembered that often you guys like certain designs I have done more than I do. So..here it is! 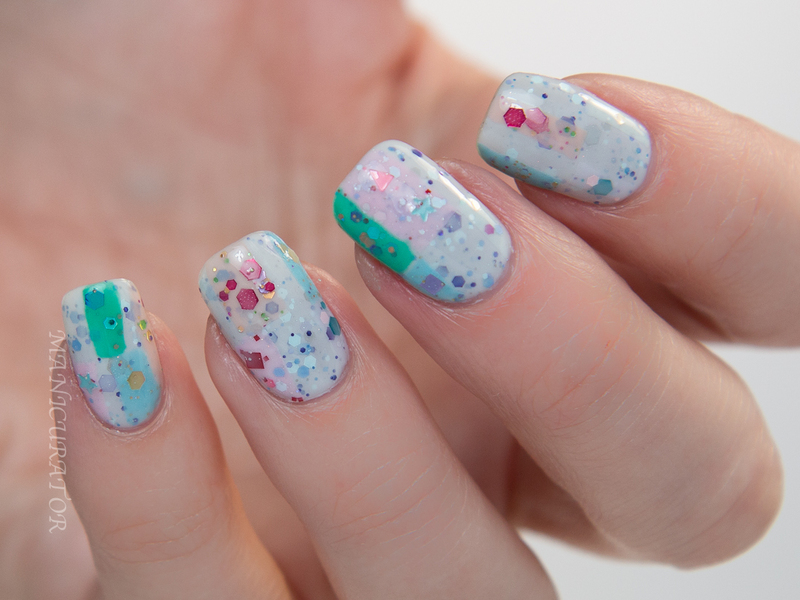 KBShimmer Meow Or Never - Based on the Pantone spring color Glacier Gray, this polish is a very pale gray, almost white in color with pops of purple, gray, periwinkle and sky blue. I adore the creative mixes of base shades and glitters in the consistently perfect formulas that we have come to expect from KBShimmer. This collection does not disappoint! I have 3 thin cts here, you can get away with 2 though. My goal here was to create a patchwork of glitters! I actually used all 7 of the glitters in this collection! 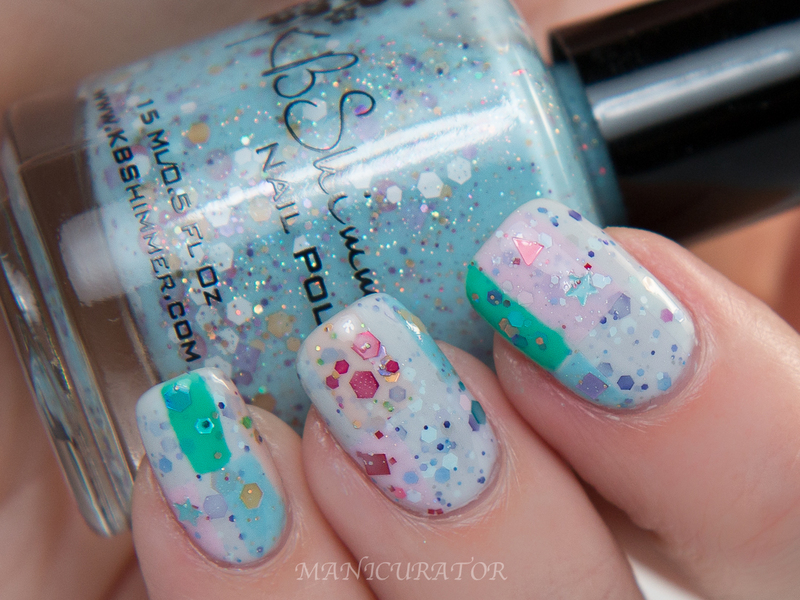 KBShimmer Wind Swarm - Based on the Spring 2015 Pantone color, Aquamarine, Wind Swarm features a pale sky blue base, a mix of purple, gold, white and pink glitters, while a hint of micro glitter offers a bit of sparkle to enjoy in the sun. 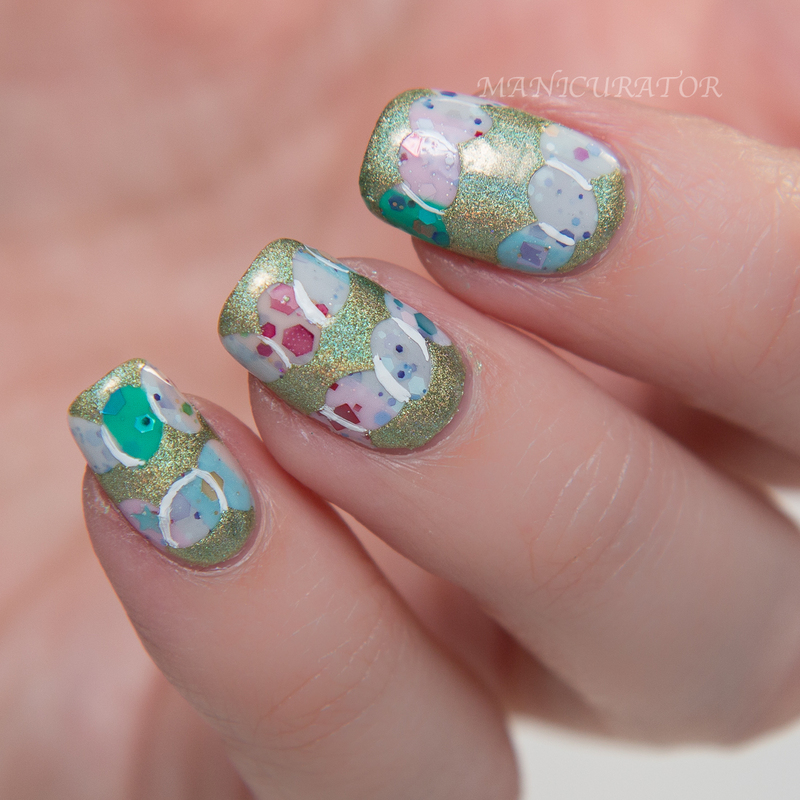 Then I used the eggs from the Spring nail vinyl sheet. Please forgive the blurry image! I didn't realize until I was in the editing phase and then it was too late to take another. Oops! So after I painted over the nail with Ins and Sprouts, I was unhappy because in my head each egg would somehow be a different glitter but it was hard to tell one from the other. So I used Eyes White Open (also from this collection) to outline some of the egg shapes. KBShimmer Ins and Sprouts - Like a new bud popping through the soil, this pale green citron colored polish is alive with linear holographic shine. So, what do you think? I'm in love with all these shades, just not this particular design. I love the patchwork look! And the white outlines of the eggs really brings the whole look together :) great work as always! Glitter patchwork! So fun! I love the base you used, Meow or Never is one of my favorites from the collection. Waaaaha that is so pretty! Well done! OMG I love how this turned out! You shouldn't be disappointed. I wasn't sure if it would work out as I scrolled through the progress photos haha, but it did seriously end up looking super cool! Especially with the outlines. Meow or never is beautiful! And i love the patchwork of glitters. I dont think you should be disappointed with how it turned out either! Oh thank you! That's so nice to hear! I know sometimes the manis I like the least are well loved by my readers. You just never know! I love every one of them, she's so genius with color combos!